Afghanistan, Algeria, Australia, Azerbaijan, Bahrain, Bangladesh, Belarus, Belgium, Brazil, Bulgaria, Canada, Chad, China, Cyprus, DRC, Ecuador, Egypt, France, Germany, Ghana, Greece, India, Indonesia, Italy, Japan, Jordan, Kazakhstan, Kenya, Kuwait, Latvia, Lebanon, Libya, Malaysia, Maldives, Malta, Mexico, Morocco, Mozambique, Netherlands, Nigeria, Oman, Pakistan, Peru, Philippines, Poland, Portugal, Qatar, Romania, Russia, Rwanda, Saudi Arabia, Singapore, South Africa, South Korea, Spain, Sri Lanka, Sweden, Switzerland, Taiwan, Tanzania, Thailand, Tunisia, Turkey, Turkmenistan, UAE, UK, Ukraine, USA, Uzbekistan, Venezuela, Vietnam, Zimbabwe. After decades of trading we have cemented our position as an industry pioneer in the Mediterranean, North African and Black Sea regions. 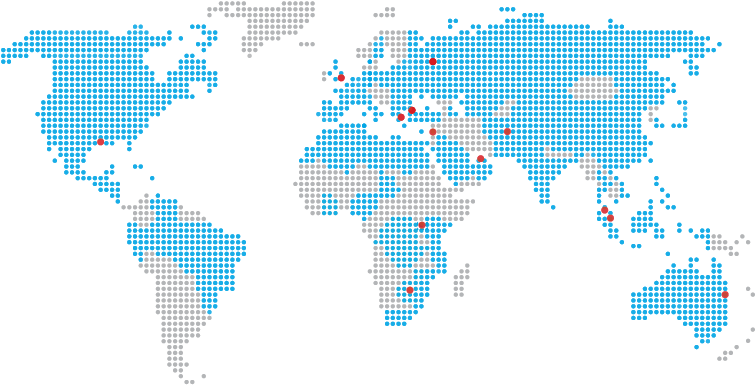 We have also built exceptionally strong ties with producers and end receivers worldwide. Our trading activities cover key strategic geographical areas, serving as a network for national oil organisation, major oil corporations and independent trading companies.